and now -- online shopping!! Some (including myself when it was first suggested) may consider it an extravagance, but between the time savings, the bus fare savings, and the ability to buy in bulk, the £4 delivery charge disappears pretty quickly. However, there are a few unexpected hazards. Crystal has given the Tesco web site very high marks because of its design. It allows searching and browsing by aisle, viewing products on the shelf, price comparisons, lists of previously purchased items, places for adding notes about how green one wants one's bananas, etc. But in the end we may never quite know what button got pushed that resulted in the delivery man showing up yesterday with a bag full of 6 lbs. 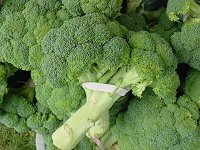 of broccoli.... At least we won't have to worry about cancer, diabetes, osteoporosis, or heart disease for awhile. 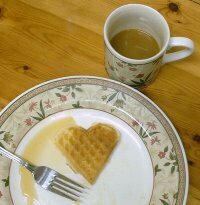 Like sharing St. Valentine's Day dinner with your lovely wife by making heart-shaped waffles together. Some things are exactly the same on both sides of the Atlantic! As she got set up, our ultrasound tech Judith asked us if we knew if we were having a girl or a boy. We reminded her that we were the ones for whom she had written down the gender on a Christmas card to open with our families. We told her that we were thrilled with our baby girl and the flood of pink that is pouring into our house. I must digress for the moment to explain the phenomenally useful British word "bits". "Bits" is often used to refer to a part of a larger whole, for example, a passage of scripture (as in, "We'll take turn reading our bits") or portions of an assignment (as in, "I had trouble with the complicated bits"). But "bits" can also refer to small things, as in "orange juice with or without bits" (meaning pulp) or "bread with or without bits" (meaning seeds, nuts, etc.). A vacation that consisted of many varied activities might be referred to as a "bitty holiday". And so on. We find "bits" to be one of our favorite bits of British-speak. Upon hearing of our pile of pink, Judith almost began to break out in a sweat -- "I hope I was right!". She quickly scanned over to the relevant portion of Bunny and sighed with relief, "Yes, those are definitely girl bits!" She proceeded to make a bunch of measurements and came to the conclusion that Bunny is progressing in grand fashion. For the techno-minded, I include the graphs of her growth, showing the results of both her 19- and 28-week scans. You can see that she is well within the normal range for Biparietal Diameter (BPD), Head Circumference (HC), Abdominal Circumference (AC), as well as for Femur Length (FL), Estimated Fetal Weight (EFW), quantity of amniotic aluid, and blood flow through the umbilical artery. These ultrasound machines are very cool. They have the ability to detect the Doppler shift of the bits it's imaging to determine their velocity. So Judith zeroed in on the umbilical cord to measure the velocity of blood flow. Much to our amusement and Judith's frustration, every time she was about to get a good measurement, Bunny would give the cord a good kick so Judith was chasing the cord all over the place. "You didn't tell me she was naugty!" she said. We're afraid we didn't get any good pictures to share with you this time. As Bunny gets bigger you can't see all of her in one shot any more. We had some delightful glimpses of her legs (she likes to cross them at her ankles, just like her parents...does everybody do this?) and other bits. Crystal thought it odd to see her moving around so much, but not always being able to feel it. We are really starting to feel like we're getting to know her. To make sure that it is mutual, I've been reading to her (and Crystal) at night. We're currently reading Charles Dickens' Hard Times. (I hope Bunny doesn't think that we're going to send her to M'Choakumchild's school!). We'll definitely have to switch to more age-appropriate literature when she starts to understand words!